Using colorful clay, we will create miniature baskets and fill them with sculpted objects of things we love. After crafting our clay baskets, participants will sculpt anything from croissants and flowers, to abstract shapes, filling their basket with beautiful or meaningful items. This project is tactile and accessible to all levels of artistic experience and abilities. 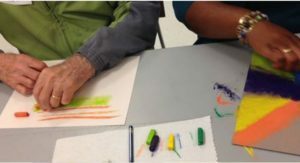 Workshop goals include creative growth, development of nonverbal communication skills, instilled confidence through creation and sharing, sense of community, and fun!